It is quite clear that composting is a good way to recycle our yard and kitchen waste. Compost is an organic fertilizer that provides nutrients for our plants, trees and lawn. If we make it properly, we can’t go wrong with compost. However, we should be aware of multiple rules and it is a good idea to follow some advices. Any organic material will eventually decompose and compost provides our garden with enough nitrogen-rich nutrients without polluting the underground water. Lawn clippings, spent plants, fallen leaves and any kitchen crap can turn into usable compost. Any part of the plant or trees contains minerals and nutrients that are extracted from the soil, when it was part of the living organism. When making compost, we should make sure that we shred all the organic matter, so they will decompose much more easily. Large leaves may block oxygen from reaching all parts of the compost pile, slowing down the decomposition process. It is a good idea to put fresh fallen leaves immediately to the compost pile, because dry leaves don’t have as much nutrients. We can also add flowers, shred papers, woodchips, sawdust, cornstalk and straw into the compost pile. However, anything we add into the pile should be properly chopped up and shredded. When we add sawdust and shredded paper, make sure that they mix well. It is a bad idea to add bleached paper, because of its chemical content. We could use newspaper with black and white ink, because it is likely made from soy. However, newspaper with colored graphics could contain some petroleum-based material. Whatever we do, we should make sure that we add organic carbon- and nitrogen-rich nutrients into the pile. Any fresh waste should be immediately shredded. The overall volume should shrink once we shred them, so it will be easier to process a compost pile. Because any compost should contain nitrogen-rich nutrients, it is a good idea to mix some grass clippings. Alternatively, we could just leave grass clipping on the lawn; because they will decompose and recycled by the grass itself. Kitchen scraps should be other great components for composting. We can add things like trimmed off roots, uneaten apple cores and bad vegetable leaves. Other things like slightly rotten whole fruits and broccoli stalks should be chopped up to smaller sizes. It will take bigger pieces to decompose. It is also a good idea to add ground coffee and tea bags into the pile; as well as the filters if we are sure that they are unbleached. Ground coffee and used tea leaves are highly nutritious material for plants. To add some calcium to the compost pile, we can crush egg shells to very small pieces and mix evenly. The increased calcium content in the soil can improve the health of our plants and make food taste better. Also, calcium from the egg shells will eventually makes its way into our body, strengthening our bones. It is a bad idea to add meat, dairy products and fat into the compost, because we could attract troublesome bugs. 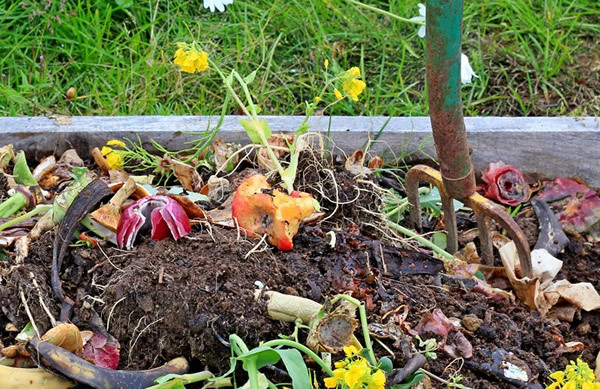 Good compost shouldn’t smell bad. Next story How To Easily Achieve Energy-Efficient Lifestyle?